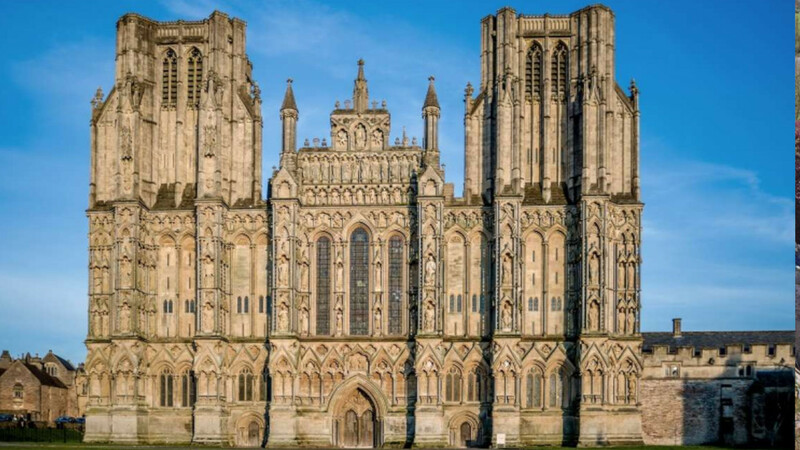 The stone used to build the Cathedral was brought from Doulting, a village east of Wells. Doulting regularly provides any stone needed for repairs as the limestone is quite soft. The magnificent West Front contains about 400 carved figures, some larger than life size, some smaller. The Virgin and Child sit over the central door. Higher up, Old and New Testament scenes are depicted such as the Creation. Adam and Eve and the Last Supper. Further up come two rows of “The Elect”, life size statues of saints, bishops, Kings, ladies and hermits. Higher still, scenes from the Resurrection are depicted. At the summit is a new statue of the Risen Christ. This was unveiled in 1986 during a service on the Green in the presence of the Prince of Wales. Originally the Cathedral statues were painted beautiful, vivid colours and gold. It must have been sight to see. 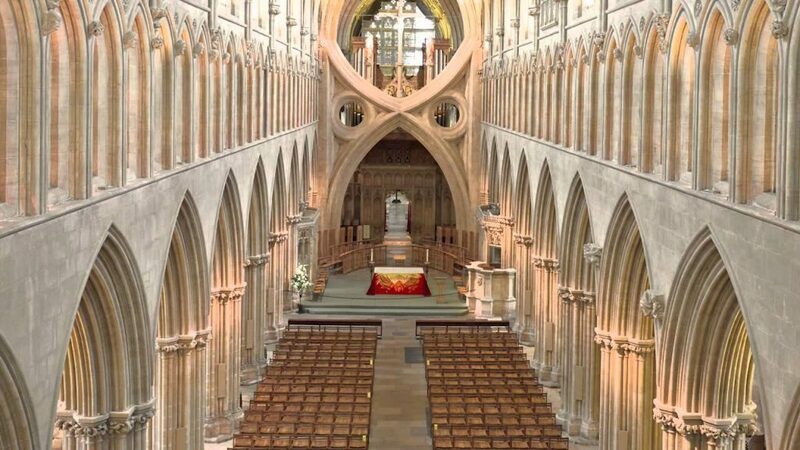 It was certainly intended that Wells was the finest Cathedral for miles around. The north transept contains a most unusual clock. Hourly, a figure of a bearded man in red (Jack Blandiver) sitting above and to the right of the clock, rings the clock’s bells with hands hammering and feet kicking. A mini castle is immediately over the dial. Four mounted knights come out. Two move to the left, the other two to the right. They revolve and at each revolution one knight is knocked backwards on his horse. This happens several times before the tournament is over for another quarter of an hour.